Warriors! Come out and plaaaaay! Hey all you boppers out there. It was just a couple months ago that I'd actually seen The Warriors. There's a chance you might not have, but there's just as good a chance you know more about that movie than you might think. Various parts of it have seeped their way into popular culture throughout the years. And now you can bring it, along with other such 70's tropes to your tabletop. 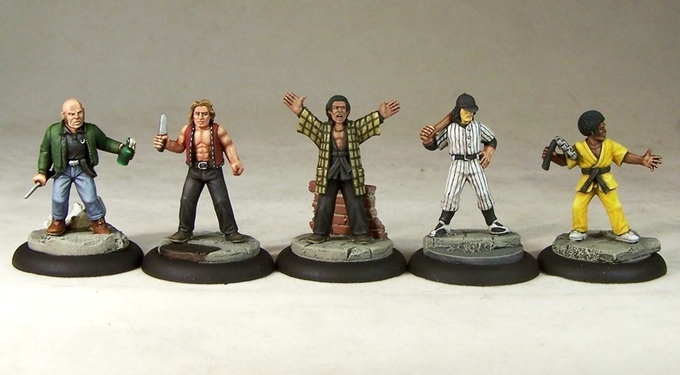 Ghetto Miniatures' New York Bop is a 1970's-pop-culture-inspired miniatures skirmish game. Assemble and equip your gang from the disenfranchised youth of New York and look to increase your rep by defending your turf against rival gangs. Whether you want to play kung-fu masters, or makeup-wearing baseball players, or leather-vest clad fighters, the choice is yours. But be warned, boppers, the streets are tough and everyone's out to get you. The campaign is about 1/3 funded, but there's still 27 days left to go in the campaign.